Staffordshire Bull Terriers have been named the country's favourite dog breed in a result that left viewers either delighted and outraged. 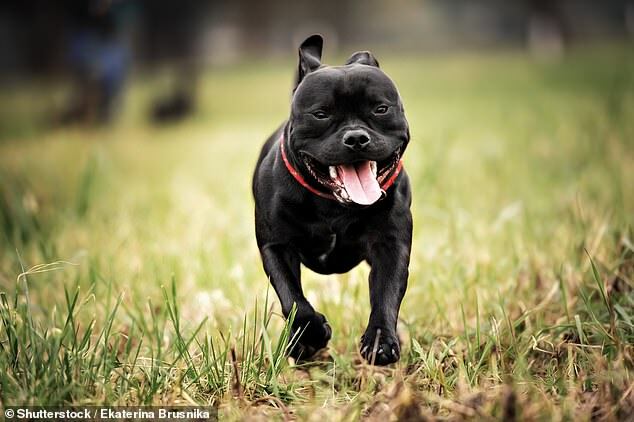 Staffies beat off competition from popular breeds such as the Labrador and the Springer Spaniel to claim the top spot in a nation of dog lovers. A mammoth two-and-a-half hour rundown last night saw the country's 217 recognised dog breeds whittled down to a top 100. 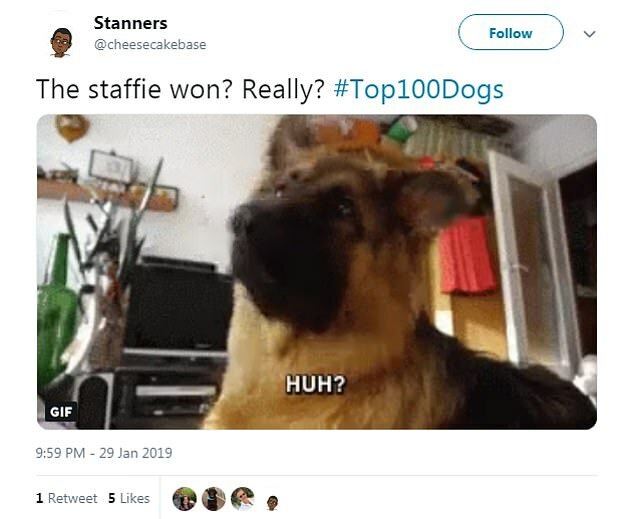 Based on a poll of 10,000 people for ITV's Britain's Favourite Dogs show, popular breeds such as the German Shepherd and Cocker Spaniel managed to nab spots in the top 10. However a shock was on the cards when last year's winning breed, the Labrador, came in at third, behind the Cockapoo, a mix of a Cocker Spaniel and a Poodle. 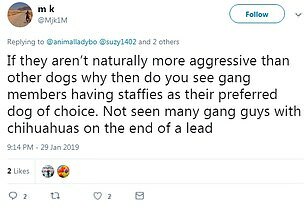 But some viewers were left disappointed by the result, describing staffies as 'aggressive' and 'dangerous'. Dogs and their owners up and down the country were transfixed by the show. Hundreds of people took to social media to post adorable pictures of their pets glued to the TV screen to see if they featured on the list. Hosts Sara and Ben visited dogs from across the nation telling incredible - and bizarre stories - two of which were about the winning breed as the top 100 were counted down. The final announcement came after a star-studded show featuring celebrities including Nicola Adams, Harry Redknapp and Gemma Atkinson and their best four-legged friends. Staffie Diesel and owner Jordan featured on the programme, telling viewers how Diesel became a lifesaver. In May 2016, the dog woke his family in the middle of the night by barking. When Jordan went to check out the noise he found the house was on fire. The entire family made it out alive and rescue dog Diesel won the PDSA award for bravery. The show also featured a doggy DNA test for actress Sue Cleaver's dog George. The mixed breed turned out to be 100 per cent Staffordshire Bull Terrier. The show also revealed how dogs are regular blood donors. The owner of Gordon Setters, Sue, explained how she regularly takes her pets to help save lives. Sharwood the Gordon Setter saved the life of Sizzle the Daschund who is a hemophiliac. The smaller dog went into cardiac arrest and received his first blood transfusion after he cut the inside of his mouth. Sharwood came to the rescue after a blood transfusion. Ben Fogle even tried out Doga - doggie yoga - with a class fulled of Golden Retrievers. The class is designed for owners to relax with their four legged friends - although one dog was seen mounting its female owner. Nine-year-old Jack Russell Dally also showed ITV how she can ride a horse. Spanky, a miniature horse, patiently rides around their US ranch home with Dally on her back - much to the amazement of their owner who said the dog did it without instruction. 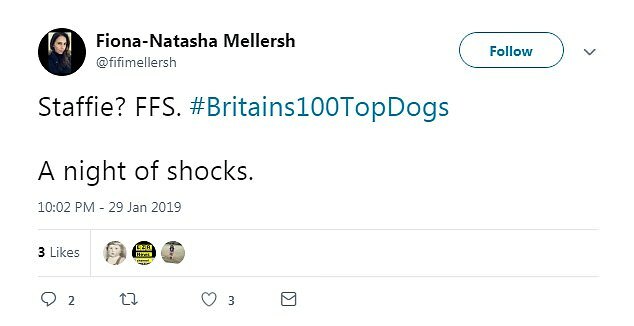 Pet owners shared snaps of their pooches glued to their TV screens as the winners of Britain's Top 100 Dogs was announced. 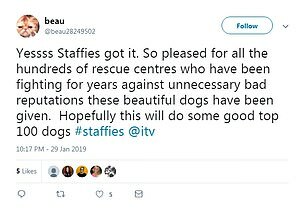 Last night's ITV announced that the Staffordshire bull terrier was the nation's top dog after the nation picked their favorite breeds in a vote from a choice of 200. And dogs and their owners had their eyes firmly fixed on TV screens during the two-and-a-half hour show - which saw Labradors drop to third place after claiming top spot last year. And delighted dog owners shared these hilarious snaps of their pets as they anxiously awaited hearing the results of the vote from hosts Ben Fogle and Sara Cox.